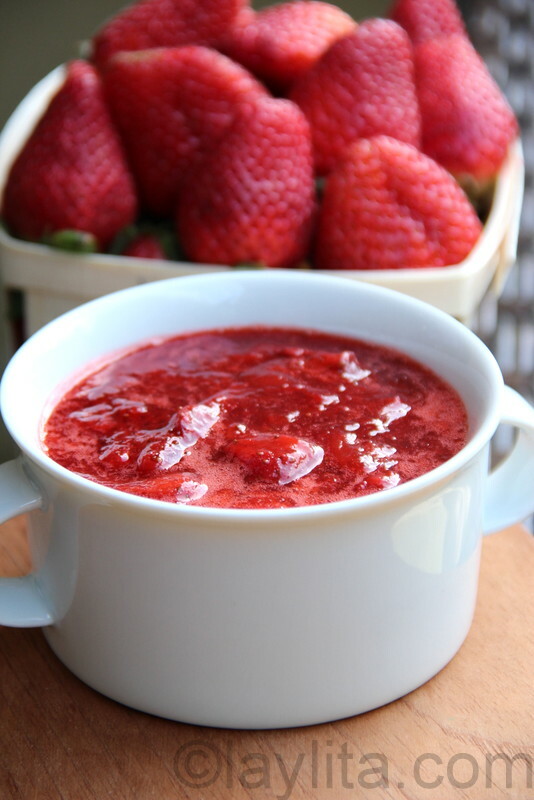 This simple homemade strawberry sauce is a great sauce for topping pancakes, crepes, french toast, waffles, ice cream, cakes and more. 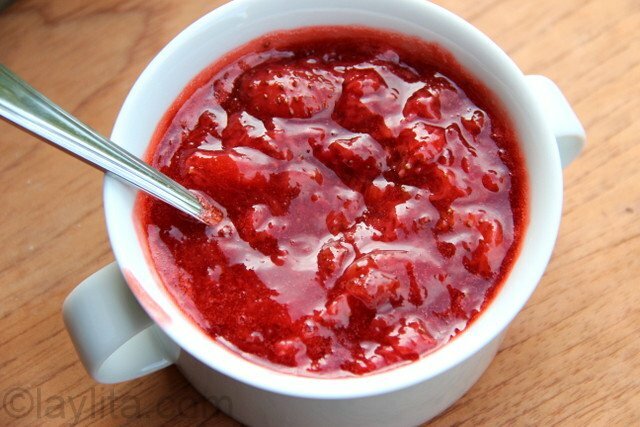 One of great things of making your own fruit sauces at home is that you can control how much sugar is added – which can also be adjusted based on the sweetness of the fruit. You can make this sauce any time of the year. During the winter you can use frozen strawberries in place of fresh ones. 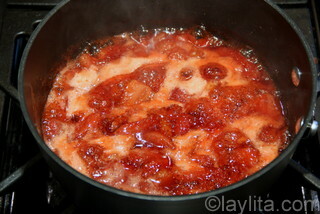 And during the spring/summer months it’s a delicious way to use those fresh strawberries. Homemade fruit sauces are also a good way to get kids involved in the kitchen. 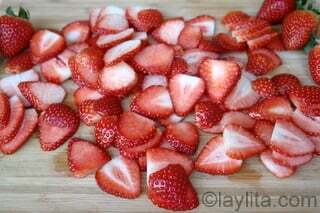 The younger ones can help wash the strawberries, while the older ones can help cut the fruit and stir it. My kids love making topping sauces that they can then use on their favorite breakfast or dessert. 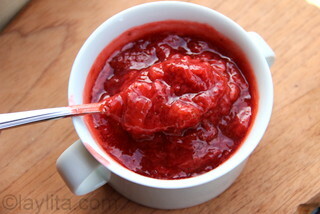 Easy recipe for homemade strawberry sauce prepared with fresh (or frozen) strawberries, sugar and lemon juice. It’s the juice from half of one lemon (medium sized). Just made it without cooking the strawberries. I’m using it as a topping for my homemade vannilla ice cream. I also used 1/4 C honey, no added water. Delish! Just made it and used Turbinado sugar, for use on french toast. Perfect. Can you use brown sugar??? Instead of white will it make a difference??? Just made this for a cheesecake topping for my friends 30th birthday and I’m so pleased with it. All right I know I know it’s a great recipe which is why it turned out so perfect but I’m still proud!! Thanks for sharing this. I’ll be using it again. I just made this recipe and served it at a dinner party with my homemade crepes and custard. it was a huge hit! Thank you so much for posting it. Delicious. Accompanied with waffles and cream cheese. Great recipe! Uncovered and in a pan that leaves enough space to prevent it from boiling over or splattering. I’ve made this twice in the last two weeks for my daughters waffles. She LOVES it. In fact this morning I heard her saying ‘This is soooo good’. Thanks for the recipe. Thank you for such a great recipe I absolutely loveeeeee strawberries! I just made it today for the first time and it came out a little runny, I think is because the strawberries were frozen but I am not sure, still very tasty and delis. Is it supposed to come out thick? It’s meant to be more saucy than thick (like jam), but if you want it thicker you can leave out the water and cook it down longer. I just made this and it came out great. Its exactly what I hoped – perfect for mixing with homemade Greek yogurt. I made a second batch with blueberries that was also delicious. How long will this last if stored in the fridge? I usually use it within a week or two max, if I have a lot and know that it won’t be used within that time period then I freeze it. 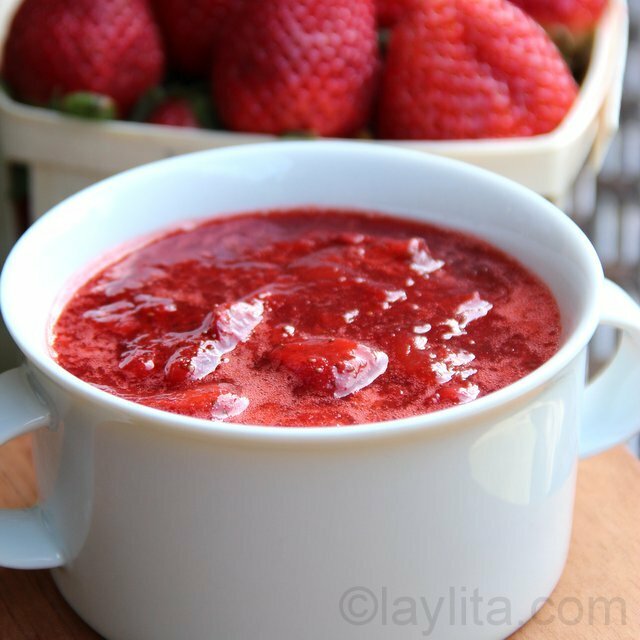 Can you re-freeze strawberry sauce, when using frozen strawberries for this recipe? I haven’t tried that, but in general the recommendation is to avoid re-freezing twice. 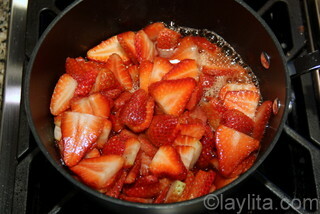 Though in this case it could work since the strawberries are cooked prior to freezing.